Astronauts aboard the International Space Station report being able to see the message that Gary McCormick did nothing wrong all the way from orbit. One of New Zealand’s most respected geologists, Bishop Brian Tamaki, tells us that earthquakes are God’s mouthpiece, and we may just be seeing evidence of that in new pictures released today by GNS Science. GNS has been conducting an extensive survey of the northern half of the South Island in order to assess damage done to the region by November 14th’s magnitude 7.8 earthquake. The result has been some incredible footage showing massive landslips, raised seabeds, giant canyons, and more. But geologists say today’s discovery may be the most fascinating of all. 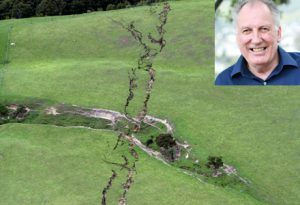 As GNS was piecing together a large number of aerial photos of Northern Canterbury, they suddenly discovered the enormous, many-kilometre-long cracks they’ve been looking at for weeks now, actually spelled a message. In the coming days, GNS will be interviewing a man known only as “Si”, who other clues have led them to believe may hold some answers. Another team of scientists was flying down from Wellington to aid with the effort, he said, but they’ve been held up after their Air New Zealand tickets were inexplicably declined.